THIS GUIDE IS CONSIDERED AS FINISHED AND WILL NOT GET CONTINUED IN THE FUTURE! Keep in mind that some items and stats are shown in 1.12 values, current status on Nostalrius Begins is 1.5 . U can follow me on Twitter, to get notified about everything i do. Blood Fury 2min CD, Increases base melee attack power by 25% for 15 sec. Human is the master race when it comes to pure dps if you decide to play alliance. Orc is the master race when it comes to pure dps if you decide to play horde. The following Specs become more powerful when you reach a higher gear level (~AQ40 Gear) or you just get all possible Worldbuffs and reach the Critcap. Alliance Sidenote: Imp. Poisons is higher DPS than Imp. Eviscerate, but in longer fights you going to risk to lose all poison stacks, especially in Naxx. This is getting fixed someday. Lets hope so. Horde Sidenote: Imp Eviscerate is better than Imp Poisons by ~2 DPS, depends on points spent. If you have Windfury available. First of all: you are playing with energy, you have 100 energy as default and you gain 20 energy every 2 seconds. That being said, you can start now with the basics. Let’s assume that you are standing in front of a boss. Check your buff bar for all group buffs, consumables and poison stacks and rebuff if needed. Fact to know: When you are grouped and stealthed, you are invisible for your groupmates too, keep that in mind, when you want to receive buffs -> go out of stealth. The first attack of a rogue, when he engages a fight, is called opener and rewards the first CPs. Deals very high weapon damage. DoT lasts 18sec, scales with AP, but consumes a debuff slot. Very handy when you have to stunlock mobs. Useless in most boss fights. Best opener for Sword Spec in my opinion, less dmg than garrote (SS can crit), but less energy cost. Easier to keep up your cycle afterwards and to get faster to the target without the stealth penalty. Average damage of Ambush is higher than Backstab, even without the 30% extra crit rate. But Backstab don’t requires stealth and you could get faster into the fight. Decide situational! Best opener, 30% higher crit rate than Ambush, you want to crit with your CP-builders. CP can be build via Sinister Strike or Backstab (Hemo/Ghostly Strike for PVP-Spec). You can receive a maximum of 5 CP. CP consuming abilities are called Finishing Move or Finisher. Maintain it 100% of the time, its your main damage deliverer. And it does not matter how much CPs you have to use for it, so use it with your first CP and further into the fight try to use it at 5CP all the time, to profit from Relentless Strikes. use it at 5CP all the time, to profit from Relentless Strikes. This is your default finisher. Ignores armor - useful for bosses with high amounts of armor. Be Aware! it consumes a debuff slot, ask your raid leader. It depends on your gear and spec, if its more useful than Eviscerate. Check Spreadsheet to get exact data and keep in mind: rupture can not crit. Finishing move that stuns the target. Lasts longer per combo point. Doesnt work on most bosses, but sometimes very useful on adds and trash to prevent them from hurting you and your group mates. Don’t bother using this, its a waste of precious CP. The most DPS is done by 3 things: spamming main ability which grants CP and using these CP to maintain SnD and use the rest of CP for dmg finishers like eviscerate. Movement is by far the best skill check of a player, to maintain the rotation isn’t really hard, but to move and keep an eye on the boss mechanics while maintaining the rotation is the tricky part. To be honest, there's not much to say here. Turn your character with the mouse, turning via A / D = DEAD or less DPS. First thing to know is, that you want to do as much DPS as possible. Your DPS is affected by debuffs on the boss and your own buffs. That kept in mind, you should always wait with using offensive cooldowns until the most debuffs/buffs are up, for example: 5 stacks of sunder armor, faerie fire, etc. Maybe adding a crusader proc to it, now its the best time to use your AR, BF, racials or whatever your race / spec offers to you. Combining cooldowns with each other maximizes your DPS on an enormous amount. On the other hand, you'll face a few boss fights where you can cleave adds with BF. Its best to not care about debuffs / procs at this time and use every possible cooldown for the cleave. Adds die faster, your DPS is UBER HIGH = WINNING. Another example are boss fights, where you’ll face enrage phases or phases where you should do the most DPS in (f.e. 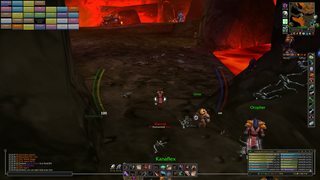 Onyxia Flight Phase), use the cooldowns there! Killing a boss and saving your teammates lifes has always higher priority, than your personal DPS! Using it less than a second before a new energy tick, will result in 8x 40 energy ticks, using it too early will only get you 7. In 1.12.1 we face a limitation of 16 debuffs that can occur on a mob / boss. So in 40 man raids, its most likely that the 16 slots are filled with useful debuffs, to push the overall raid DPS or for defensive matters. In 20 man or lesser raids, you can check on your group setup. If you can find space on the debuff list, than its fine to use deadly poison or rupture/garrote, but only if its actually pushes your DPS. Attributes are the basic building blocks for a character's combat ability. The five primary attributes are strength, agility, stamina, intellect, and spirit. These five attributes along with armor appear on the character sheet under Base Stats. These are often referred to as simply stats. A number of secondary attributes affect specific areas of combat more directly, and are often influenced in some way by a primary attribute. Secondary attributes include critical strike rate, damage absorption, attack power, spell power, and many others. All characters inherently have some amount of each attribute that increases with level depending mainly on class. For example, a mage will have more base intellect than a rogue, who will have more base agility. Increasing these attributes is mainly done with equipment, as well as temporary effects such as buffs, elixirs, scrolls, auras, and many other means. Nearly all combat mechanics rely in some way on one or more character attributes. Increasing the appropriate attribute will increase damage done, reduce damage taken, increase healing done, affect a character's mana or health, or other benefits. Understanding how these attributes work is important for effective combat. Increases attack power with melee weapons by 1.
expect that crit & agi value is higher in Seal Fate Specs. Especially for BiS gear. If you want to calculate with Spirit of Zandalar just add factor *0.15 to Agi and Str. These numbers are averages and you can use them to calculate your Items, without using my spreadsheet. Your chance to miss decreases by 0.04%. Your chance to score a critical hit increases by 0.04%. Your opponent's chance to block your attack decreases by 0.04%. Your opponent's chance to parry your attack decreases by 0.04%. Your opponent's chance to dodge your attack decreases by 0.04%. What this means is that if places 1-6 total up to 100%, Normal hit will be knocked off the table and never occur. Important to know is that a boss has a base dodge chance of 5.6% and can only parry/block attacks that are made from their front, but since a rogue should never be attacking a dungeon/raid monster/boss from the front, we will see their parry/block chance as 0%. Your base chance to miss is 24,6% when dual wielding against a boss. Another good thing to know is that when you as a player gain +hit you do not exactly increase your hit chance, instead you reduce the chance to miss. The total amount in the hit table can not be higher than 100%. Your chance to hit is what is left over to reach 100% after adding all the other things. Lets say your chance to get a miss+dodge+glancing blow+crit = 80%, then you have 20% to get a normal hit. Hit refers to physical damage that occurs as a result of an attack made with melee or ranged weapons. The base chance to miss with maximum weapon skill (300) against an opponent of equal level is 5% for two handed and 24% for dual wield. This means that if you make 100 attacks against a boss, you will deal 0% damage 30 times, 200% damage 10 times, 100% damage 20 times and 70% damage 40 times. Note that you have 35% crit but only 29.8% of your strikes will be critical strikes, this is because you are over the thing people like to call crit cap. Its quite a nice name, but unlike the hit cap it is not a fixed value. The crit cap is the same as the % of swings that will not be glancing/dodged/missed. As explained earlier, the +6% hit will not increase the chance to get a normal hit... but rather reduce the chance to get a miss. There are two big difference between a white hit table and a yellow hit table and that is that yellow hits can not be glancing blows and the standard chance to miss is only 8%. The first hit cap is the most important one, it is commonly known as yellow hit cap. This hit cap is the amount of +hit needed to never miss with special abilities which damage is shown with yellow text on your screen. You will need +8% hit to always hit with your special abilities against a raid boss. This hit cap is a lot more important than the next one because missing with your abilities such as Sinister Strike, Backstab or Eviscerate is a huge waste of energy and global cooldowns, and also this one is a lot easier to achieve. The second hit cap is the white damage hit cap. This is the amount of +hit need to never miss a normal melee swing. You will need +24.6% hit to always hit a raid boss, as you might notice 24.6 is a lot higher than 8 and this is the reason why its not as important as the first one, since you would have to give up a lot of other stats in order to reach 24.6% hit, and there is nowhere near enough +hit on gear early on at lvl 60 to reach this cap. Poisons are affected only by Spell Hit and special talents, so dont bother about them. Critical strike and how to calculate crit cap and why is it important? Critical strike (often abbreviated as crit) refers to 100% bonus physical damage (twice your normal damage) that occurs as a result of an attack made with melee or ranged weapons. The chance to critical strike can be viewed by opening your spellbook and moving your mouse over the attack ability shown there. It is increased by agility where you increase your critical strike chance by 1% for every 29 points. Now to elaborate why is crit cap important, well its quite simple actually, there is no point of having more crit than crit cap because we already established that the total amount in the hit table can not be higher than 100%. In short: after reaching 8% Hit, Crit > Hit, until you reach the Crit cap. Here is a list of items that you can easily obtain in 5/10 mans without big efforts. This gear setup is called Pre Raid BiS Gear and is the best way to get into your first raids. T0.5 4-Set Bonus is a good way to push your DPS, when you can’t reach higher lvl gear like T1/T2 etc. Feel free to check out the spreadsheet, to calculate the values of your current/future gear. *The Lobotomizer uses a debuff slot and i don't recommend it for 40 man raids. Its totally fine in 5-20man. ** Distracting Dagger is just an example, its best when you don’t have Mugger’s Belt, otherwise every other fast Dagger is nice to have with a high dps rate. I did the calculations without the World buffs and fully Raid buffed of course. For the alliance side, as human. Feel free to create your own Horde equivalent Version of it, by using your brain or my Spreadsheet. 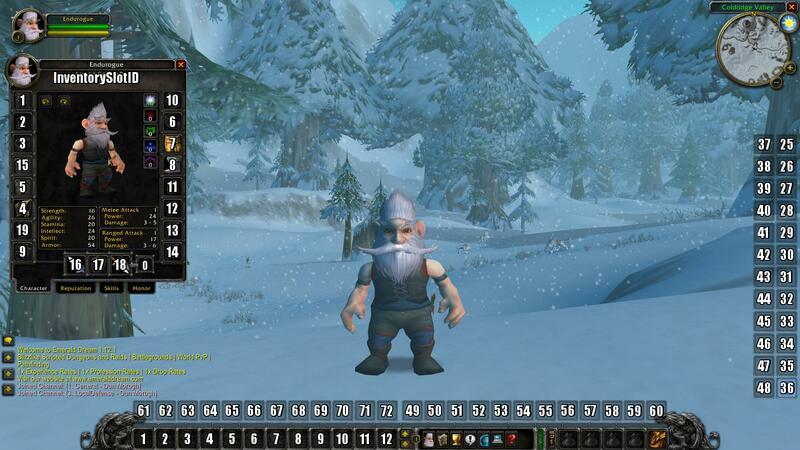 Biznicks 247x128 Accurascope not sure if working on Nostalrius, it shouldnt! Seal of the Dawn or Mark of the Champion are the best trinkets against undead. Feel free to download and report bugs or wrong item attributes and stuff. Picklocking - a REAL ROGUE trains his pick lock skills! you can make some extra gold here. Tip: Train it while leveling your character, your reachable max skill increases by 5 for every level. Here is a list of useful consumables you should bring to a raid. Ground Scorpok Assay & R.O.I.D.S. Juju Might currently higher droprate on Nostalrius, than retail, go get it! This macro allows you to attack your target with Sinister Strike and turns on the auto attack. Useful for every target switch when you don't have energy left or you don't wanna right click on each target. Attention: you need to put the Spell Attack in your action bar! In my example I put the Spell on the first action bar on the slot 9. This can also be used for BS or HEMO. Just replace the spell name and the energy cost. This Screenshot can help you by finding the best positions and slot numbers for your macros. or any other slot, by using this screenshot. THANK YOU VERY MUCH! To all who helped and read that thread. I’m open minded for all questions and suggestions according to the rogue guide and hear them out. If you want to add or change stuff, just contact me or post in this thread. I’ll try to keep it updated all the time. Last edited by Oto on Thu Oct 22, 2015 6:17 pm, edited 73 times in total. The guide is not bad for beginners, experienced rogues would find it lacking tho. The second talent build is not optimal, Improved Poisons > Vile Poisons. Depending on your weapon speeds, 2 CP SnD is sometimes optimal as opener. I strongly disagree with your AP=crit / AP=hit / ... tables. Are you only using the linked spreadsheet as a guideline or have you done your own, empirical research? A lot of the stuff in the guide is for 1.12 and thus not applicable on Nos for some time. Also the guide was obviously made for another realm and caters to some of its specific ... features (bugs). Consider revising those parts. Good job tho, I imagine 99% of the rogue population on the server can learn something from this guide. Hi Kishkumen, nice to see you here again. First of all, thx for letting me know about that. As i stated above, i will update the whole thing for this server as i am lvling up here. I dont know that much about the server yet, just wanted to bring this to the forum as fast as possible. Maybe the best rogue guide out there, almost as good as poison spec rogue guide. theres no way to beat the poison spec rogue guide.. sry to disappoint. Not entirely sure what you mean with 5cp to profit with ruthlessness as ruthlessness should still have the 60% (if rank 3) chance to proc from 1cp finishers (or 2 or 3 or 4). Maybe you're confusing it with relentless strikes, which has a 20% chance per combo point spent on the finisher to restore 25 energy? Made a quick number crunch in my sheets at a few selectives in the preraid bis list for Combat Swords. 2,1141 dps in favor to Unforgiven. Current content: Guard Captain (Horde), Blackhands (Alliance). Will change when DMF: Maelstrom becomes available on certain mobs in raids. Please notice that this is strictly for combat swords. I'd like to add in for those interested that 2% increase chance in poison proc will increase the dps for Combat Swords by approx 3,616 with the Dal'rend set. If we compare this to one talent point in vile poison to increase poison damage by 4% you only gain approx 1,4464 dps for that talent point. Why would you simulate with 14,400 sec? Unless your spreadsheet also accounts for downtime between trash pulls, energy regen in between, movement on bosses and such, it's not methodologically correct to simulate using such a long time frame. Longest fight in MC is a few minutes, Nefarian is <10 mins on progress, much less on farm. No fights in the current content allow for double ARs and none in BWL allow for more than 2. Moreover, trash and bossfights involving movement and energy capping are not unimportant. Therefore, to make simulations based on a large timeframe, is to ignore these factors of raiding. Don't get me wrong, this hardly invalidates your item comparisons, as those are hardly affected by whether the fight is short or long. However, if you also base talent choices and optimal rotations on the same spreadsheets, you will encounter errors. Using my sheets in comparison to recap for personal dps the limits are currently +/- 2dps over time. What you want to know from a sheet is (A) how an item performs, and (B) how it performs in comparison to other items over time. 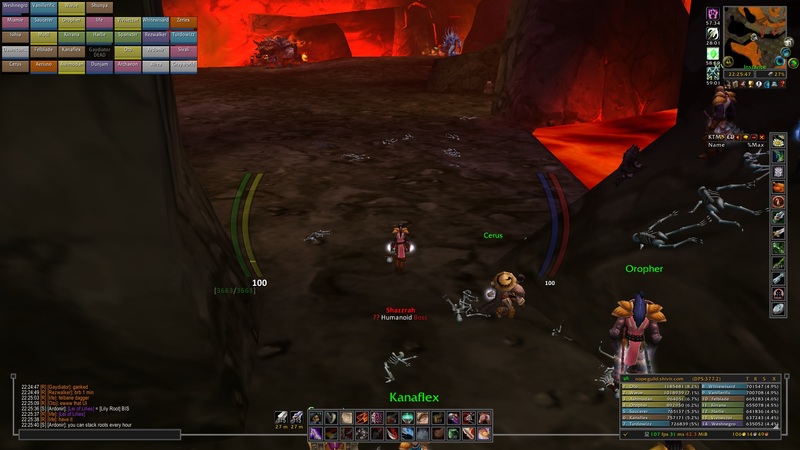 When comparing items in these settings you need a large sample size as you will otherwise yield results that are affected by the many RNG factors that the rogue class is subject to in this version of World of Warcraft. Adrenaline rush is a static cooldown which adds if used correctly about 160 energy, blade flurry increases the attack speed by 20% for 15 secs every 2 minutes. These cooldowns are obviously important and used on boss fights as you mentioned (whilst blade flurry is on ocassions used on smaller packs if you are moving slow). The core of the calculations however, does not need to factor these events when calculating after whichever rotation you are using, and the addition of these variables will only increase the DPS for that specific amount of time and will not yield any significant results of crit/hit/ap values in regards to the passive core talents in the spec - if anything it will create an unbalance in the sheets ability to reflect these values. When calculating for shorter durations these values can be chosen to be included, which they are, but they will not magically make item A superior over item B.
TLDR 1: The purpose is to gain strong evidence of how items perform and compare against each other, and to do this you need a huge data sample that is not affected by non contributing factors to the basic variables and rotations.